Annual home price growth in the San Francisco metro area has tapered off significantly since last spring, says the most recent data from a prominent real estate index, but properties are still appreciating at about twice the national rate. And MLS statistics for individual Bay Area regions also show solid year-over-year price gains. According the most recent S&P/Case Shiller Home Price Indices, home prices in the San Francisco region increased 9.1 percent year over year in October 2014, the most recent month for which the company has collected and analyzed data. Numbers from previous indexes show that annual appreciation in the region fell into the single-digit-percent range in August of last year after posting 21 consecutive months of double-digit gains. Yearly price growth in the region exceeded 20 percent as recently as March 2014. The gain placed the San Francisco metro area No. 2 in the U.S. for the highest rate of annual appreciation in October, slightly trailing the Miami region. The index puts price growth from October 2013 to October 2014 at 4.5 percent for its 20-city composite and 4.6 percent nationwide. San Francisco was one of eight markets on the 20-city composite where prices were up from September. With a month-over-month gain of 0.8 percent, San Francisco tied the Tampa region for the largest increase in the nation. Meanwhile the 20-city composite and national index had respective price decreases of 0.1 percent and 0.2 percent. A look at October MLS data for single-family homes in Pacific Union’s individual Bay Area regions shows annual price appreciation in every market in which we operate, ranging from 7 percent in Sonoma County to 31 percent in San Francisco County. At $1.18 million, the median sales price in San Francisco reached a two-year high, and prices decelerated only moderately in the final two months of 2014. 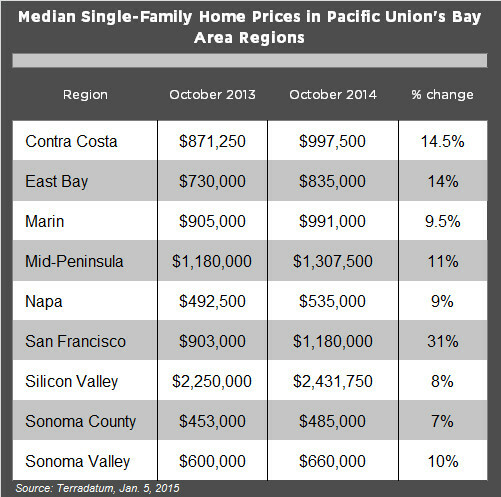 See the chart below for breakout data for each of our Bay Area regions. Previous PostPrevious Real Estate Roundup: Bay Area Homebuyers Require Largest Salaries in U.S.